New litigation team members Kristin A. Eisenhaur, Derek J. Ashton and Kimberlee Petrie Volm. Derek’s accomplished practice involves complex civil litigation with a focus on trial work in the Hospitality, Transportation, Product Liability, Regulatory, and Professional Services industries. Derek has tried over 135 jury cases to verdict, winning over 80 percent. Prior to private practice, Derek served as a Deputy District Attorney for Multnomah County where he tried major felony criminal cases. He is among a select group of attorneys selected by the Portland Police Union to represent police officers involved in deadly force incidents. Derek received his J.D. from the University Of Oregon School Of Law, and his Bachelor’s Degree in Finance from the University of Oregon. He is admitted to practice law in Oregon and Washington. Kimberlee’s practice involves complex civil litigation in the Manufacturing, Professional Services, and Transportation industries. She has experience defending Federal Employers Liability Act (FELA) claims, and representing businesses and individuals in personal injury actions. Kimberlee also has experience as an appellate attorney representing clients in the Oregon Court of Appeals and Oregon Supreme Court. Kimberlee received her J.D. from Lewis and Clark Law School and her bachelor’s degree in political science from the University of Wisconsin –La Crosse. She is admitted to practice law in Oregon and Illinois. Kristin joins the firm with 14 years of experience in all areas of complex litigation and trial preparation in state and federal courts. This includes civil litigation, white collar criminal defense, personal injury and OLCC litigation. Kristin received her Associates Degree in Criminal Justice from Clackamas Community College and her Associate’s Degree in Paralegal Studies from Pioneer Pacific College. Kristin is a member of the Oregon Paralegal Association. About Sussman Shank LLP - Founded in 1960 in Portland, Oregon, Sussman Shank is a full-service business, litigation, and commercial bankruptcy law firm with over 30 lawyers. Our clients include public and private companies, government entities, institutions, non-profit organizations, and individuals. 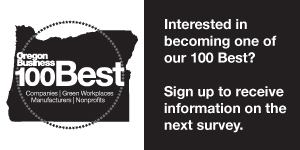 In 2017, Oregon Business Magazine named Sussman Shank one of the "100 Best Green Workplaces in Oregon."